San Francisco-based Sourcery announced its Series A $5 million round of financing, led by Marker LLC. Founded in 2012, Sourcery is trying to upend the food-supply-chain industry by becoming a SaaS-based acounts payable, invoicing and payment platform for restaurants, including corporate kitchens. "The reality for kitchens is that it's [back office operations] worse than other businesses," said Na'ama Moran, co-Founder and CEO of Sourcery. "Invoices come in every day for produce and dairy... the average number of invoices is around 200 paper invoices per month [for a restaurant]." Indeed, with the food industry - as can be imagined - kitchens are dealing with perishable and dispensable items that need to be ordered frequently, sometimes daily. Sourcery helps restauranteurs and kitchen operators to manage and importantly make sense of those daily invoices. "We convert those invoices into living insights," said Peretz Partensky, co-Founcer and CTO. "You can have this living draft that shows you exactly what you've been spending on." Restaurants scan their invoices and send them to Sourcery. Sourcery then takes those invoices and organizes them by each line item. The benefit is that, as Partensky says above, restaurants can gain insights into their purchasing habits. For instance, if a restaurant wanted to know how much it's been spending on cauliflower, it can pull that information up vs going through scores of invoices and typing those purchases manually into a spreadsheet. By sending them to Sourcery to scan and upload, that data input time is saved. Or if expenses start going up, a restaurant can identify the source of rising costs faster by looking up line items that are rising each day or month. "Once an invoice comes in, we use technology and human verification to input the date, total amount, and each line item," Moran explained. "This enables you [the restaurant] to categorize each item [by vendor, by ingredient, by date, etc.]." The sweet spot for Sourcery is restaurant groups with more than five locations, "because at that scale you need process automation to survive," said Moran. Sourcery's customers range from restaurants, such as Austin, Texas-based Snap Kitchen, and fast-growing tech companies, such as Thumbtack, Dropbox, and Airbnb. They pay a subscription fee based on the number of invoices they process. Small businesses are priced at $299 a month whereas a large business is charged $5,000 to upwards of $10,000 a month. Those are businesses processing thousands of invoices a month. So why would restaurants pay this amount? "The ROI analysis involves how much time they're spending on manual data entry today," said Moran. "With larger customers, there's also an added component of us providing line-item level [transparency] about price fluctuations." For instance, by being able to analyze the costs of each ingredient or line item, a customer can see which prices are rising, enabling them to make cost-saving purchasing decisions. In addition, Sourcery helps its customers pay those invoices online, making Sourcery a de facto payment processor - a path the company didn't originally set out to be on [more on that below]. But the payment feature has given Sourcery another value-added service in its toolbox. Now Sourcery can not only offer accounts payable software that allows kitchens to have better insight into their purchases, it can help them pay for those purchases via ACH. "We save everyone on bookkeeping," said Moran. "We pay not only food service invoices, we can pay utilities... our tool is flexible... we've paid over 1500 vendors." Evolution - forget suppliers for now! At its start, Sourcery had always envisioned making the supply chain for food purchases more transparent. Partensky, who has a PhD in biophysics (because every accounts payable startup needs one of those experts) said it was his biophysics background that made him look at the food logistics industry as an organism - with a very complex set of systems to manage it. The management system of food suppliers,in particular, seemed very archaic. 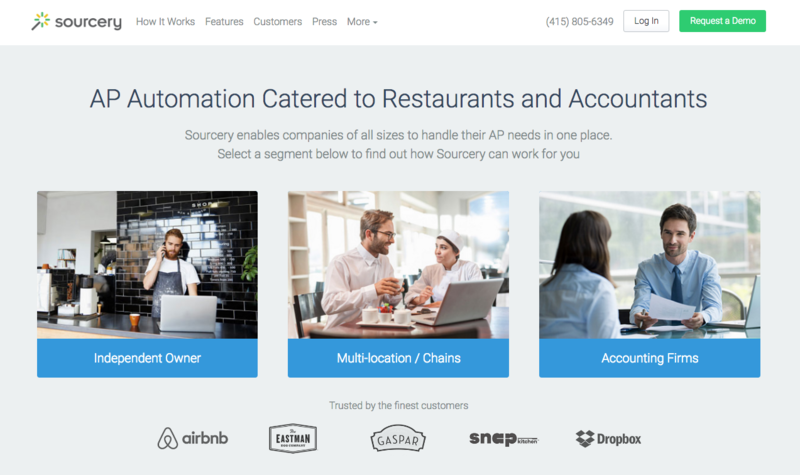 So Sourcery initially set out to automate the ordering of food between restaurants and suppliers. "When we started, we were focusing on chefs," said Moran. Sourcery wanted to help the chefs order their ingredients in a more updated fashion. Many chefs call in their ingredients at the end of the day, she said. "There's no one vendor on the other side, just a voicemail and they're leaving their lists on a voicemail... Initially, we were focusing on streamlining this process of ordering." By automating the process, Sourcery would make those purchases more streamlined and more transparent. And by making those purchases more transparent, both sides could extract real-time data about those purchases, so the theory goes. Here's the rub. Suppliers - turns out - didn't want all that transparency, according to Moran and Partensky. "We found there was a big push-back from the suppliers to participate because they didn't want the price transparency," said Moran. So by 2014, two years into their startup and having already graduated from Y Combinator (Winter 2013) with $125,000, plus a $2.5 million Seed round raised, they shifted focus. Sourcery shifted to being a platform to manage accounts payable because that approach didn't need suppliers buy-in. "We didn't need suppliers to scan invoices," said Moran. "We were able to extract the same insights from the invoices... and now with accounts payable and managing cash, we've been able to create a strong relationship with suppliers who perceive us as enabling them to be paid faster." Lesson learned: In a two-sided marketplace, focus on one side first and do it well. Then the other side will most certainly come. Today, demand side is progressing with kitches. And Sourcery has a few vendor accounts testing out its Vendor Accounts Receivable product.